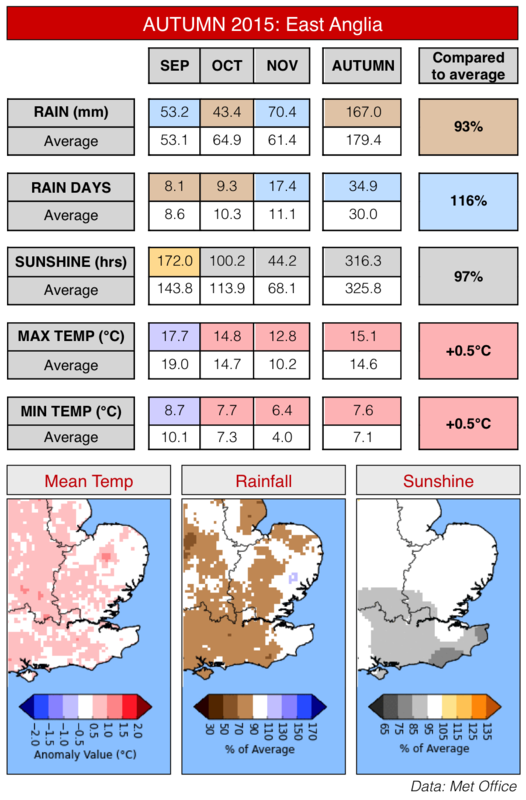 With the start of the meteorological winter now passed, figures released from the Met Office suggest that Autumn 2015 in East Anglia was warmer than average by 0.5C, slightly drier than normal at 93% of the average rainfall and also marginally duller than normal with 97% of the average amount of sunshine. The month of November was the 2nd warmest on record in East Anglia (1994 being the warmest), and also the 9th dullest for the region. Averages can hide some of the more interesting aspects of the autumn weather, and while November was overall very mild there was a brief cold spell during the weekend of 21st-22nd which saw the first snow of the season across some parts of the region. There were also several windy episodes during November, with gusts in excess of 60mph in parts of the region - generally stronger gusts than any spell in autumn/winter 2014 in East Anglia. Looking further ahead into the first half of December at least there is little sign of any prolonged colder spells, but a continuation of the mild and occasionally wet and windy conditions that were frequent during November, with just some brief cooler spells.